Growing up, Christmas Eve was a crazy day. Much like a regiment on the move, we were put through the paces: Cleaning, cleaning, cleaning… followed by more cleaning! Then just when you were convinced all the work had surely squared things with Santa, it would all just stop. Magic! The late afternoon saw showers for all, a single gift opened which was generally a new outfit for church, the now infamous potato soup dinner, and then off to Christmas Mass. Returning home, we’d get in our pajamas, hang our stockings and be sent looking for sugarplums for the night. The flurry of activity was choreographed by my mother as she got things ready for the big Christmas Day dinner which was (and still is) held at her house. Christmas Eve dinner was to be a quick and easy affair. I asked Mom where the potato soup and cheese ball came from. She said it just sort of happened. Nonnie started making them when she lived with us and the tradition just lived on. With great fondness I remember the cheese ball with its nutty, crunchy outside and cheesy, creamy interior smeared on Triscuits. It was for those piled-high delicious cracker treats that I would force my way through the potato soup; it certainly wasn’t the flavor. Growing up, I never liked the potato soup – I’m not sure any of us kids did – and vowed that I would change that tradition when I was on my own. Which I did. And never looked back. It wasn’t until last week when a certain cousin reminded me of this tradition and suggested adding it to the blog. I had no idea that across town at their house they also suffered through the travesty that was potato soup. And more interestingly, she wanted me to recreate it. Let’s call it the Advent Miracle! Must be worth another try. With that auspicious start and working within the very specific confines of my notes, I threw it to chance and went to my trustiest source of all food seventies: Julia! And there in The 40th Anniversary Edition: Mastering the Art of French Cooking (page 37) is Potage Parmentier [Leek or Onion and Potato Soup]. Aha! I figured between Mom and Mrs. Child, I could probably get a close enough version to pass along to Felissa for her review and comment. Alas, as for the cheese ball, “you can’t go home again” has come to roost. I made it exactly as directed by Mom from the jarred Kraft cheese combo, etc., and it was … not so great. They say tastes change so I’ll chalk my disappointment up to that and eventually work on a version that’s a bit updated. But that’s for another time. Can I tell you – in that odd way that when a window’s closed, a door is opened – I loved the potato soup. I mean that I really, really loved it. The taste, the texture, the aroma … perfection. And in that way that history repeats itself – God love ’em – my fellas half-heartedly sipped through the potato soup to get to the cheese ball which was attacked with gusto … double-decker Triscuit and cheese ball sandwiches were devoured while soup spoons lay untouched. It warmed my heart, especially when I realized that I’d have leftovers for lunch. A quick note that my crackerjack photographer (my daughter, Stephanie) is off to Machu Picchu and so what photos there are are are all mine and all my fault (you will see what this means in a sec). And this is with her fancy camera … The gods help me if she ever decides a free meal isn’t worth the together time that this blog entails. And away we go … step-by-step directions followed by the recipes. The cheese ball. No kidding, these are the ingredients (first photo). I thought it might be hard to find the Kraft jarred cheese but my local Giant had them. Double dog bonus: you can reuse the jars as little juice glasses after a thorough cleaning; that’s what my mom did. She was a recycler before it was cool. Ha! Bunny as Earth Mother. I digressed … Everything gets whizzed up in the mixer using the paddle attachment until combined. Next, roll into a ball and then coat in toasted nuts – I used walnuts but pecans work too; just make sure you toast them to get optimal flavor and crunch. If the cheese mixture is a bit loose and difficult to roll into a ball at first, you can refrigerate it to firm up for about twenty minutes or simply put into a bowl or crock with the toasted nuts on top. This may, however, offend nut lovers who like the higher nut to cheese ratio of a ball. 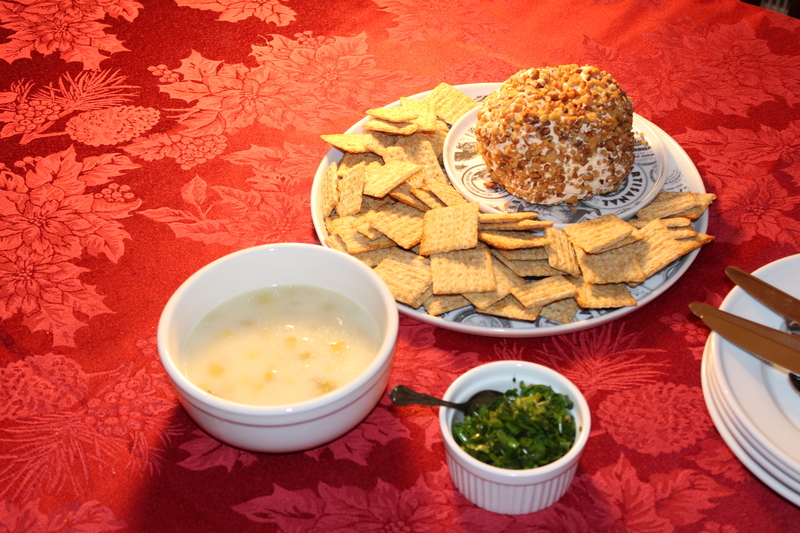 Here’s the cheese ball in all its glory with the requisite Triscuits … The fellas, however, liked it better with pretzel squares. Good to know. Leeks are terrific in soups. They have the flavor of onion without the sweetness that you’ll sometimes get when you sweat an onion (think soupe a l’oignon … Thank you, Julia! Makes me wish I’d paid more attention to Sister Vicious in high school French class … the French can make even onion soup sound so elegant and mysterious). 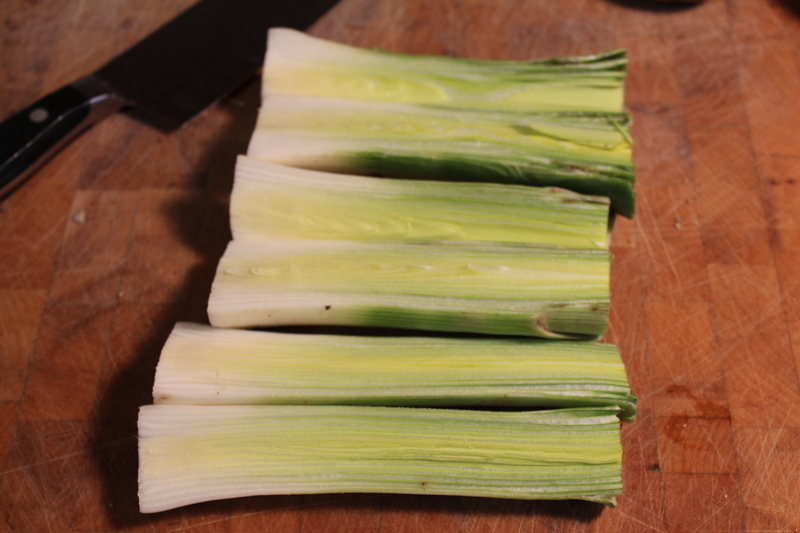 Leeks may seem huge but you cut off the root end and only use up to the light green part. Three leeks yielded three cups chopped. Also, leeks are grown in sandy soil and that sandy soil will get into every nook and cranny (see my half-cut stalks above). I always cut to the size I need and then swish and soak in my salad spinner; the leeks float to the top and the grit falls to the bottom. A good rinse helps ensure you don’t have a crunchy soup. I shudder at the thought. Next, turn off the soup, add a knob of butter, a healthy splash of cream, and 17 grinds of pepper … give or take. Next, I scooped about half of the soup and gave it a whirl in the Whiz-O-Lator 5000 and poured it back into the pot. This would be the point where having a real photographer would have helped; my four attempts at pouring blazing hot soup into the blender while holding Stephanie’s camera have left me thinking your imaginations can carry you through to …. Dinner! For the photo, I sprinkled the chopped herbs into the one bowl and then thought this is just too precious so I stirred the rest into the pot for serving. They stayed green (and still were today at lunch) and make the soup a beautiful color and really add to the flavor. Oh, and there’s the cheese ball. Of course, now I’m on a mission to create a good one. I mean, it’s cheese … there’s got to be a good one out there. Suggestions greatly appreciated. Otherwise, I’ll report back if I find success. Okay, Felissa … tell me what you think if you try the soup. Eat well! Blend the first five ingredients together using the paddle attachment of the mixer. Scrape down the sides and bottom to make sure all of the ingredients are incorporated. Form into a ball. If it is too soft to form into a ball, chill for about 20 minutes to firm up. Roll in the nuts. 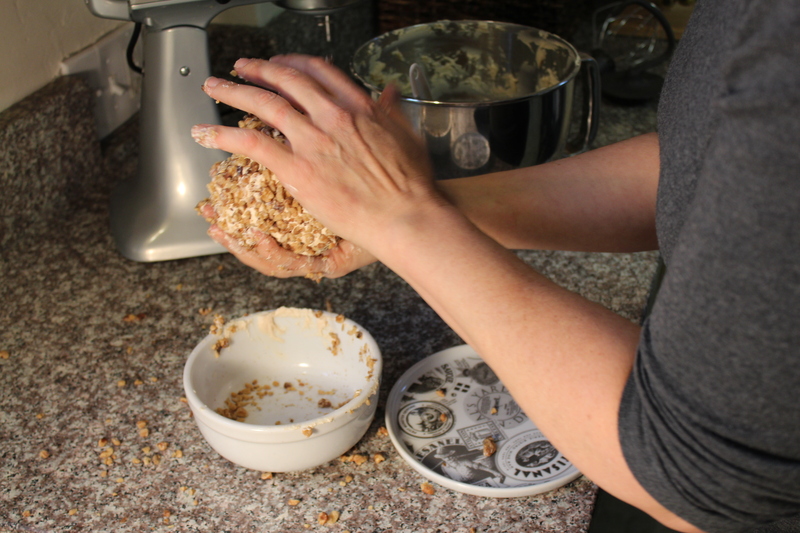 You can also skip rolling the ball; just put the mixture into a crock or bowl and serve with or without the nuts on top. In either case, cover completely in plastic wrap and chill at least two hours or overnight – better the longer it sits. Serve with Triscuits. Or pretzel squares. These measurements do not have to be exact – this is a very forgiving soup; adjust to suit your taste. Cut the root end and dark green ends of the leeks. Slice them lengthwise and then into thin half moons (1/4 inch or so). Rinse thoroughly in clean water, swishing to remove all grit and dirt. 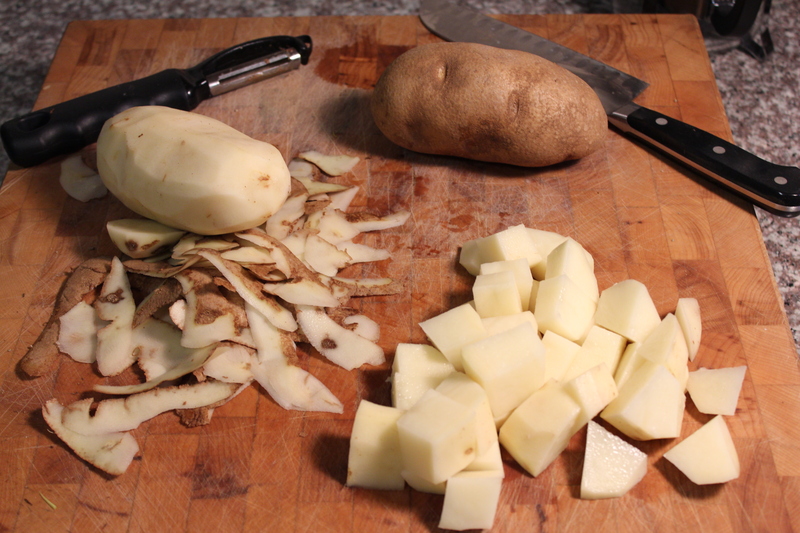 Peel the potatoes and then dice into bite sized pieces. Put the leeks and potatoes into a soup pot with about 6 cups of water (it should come up to the vegetables, not cover them). Bring to a simmer and cook partially covered for 40-50 minutes (until the potatoes are soft to the bite but not falling apart). Turn off the heat and add the butter, cream, and pepper. Adjust seasoning to taste. I like a lot of ground pepper. Put half of the soup into a blender until a smooth consistency; return to the pot. For a completely smooth soup, blend it all. For chunkier, blend less. Finally, the chopped herbs can be stirred into the pot (my preference) or sprinkled on top of individual servings. HINT: If you’d like a thicker soup, add an extra potato or two but don’t increase the water. Or, simply reduce the water to about 4 cups. This entry was posted in Appetizer, Soups and tagged Appetizer, cheese ball, Christmas, easy to make, family meal, feeds a crowd, finger food, leeks, Make-Ahead, party, party food, Potato, soup, tradition, vegetarian. Bookmark the permalink. 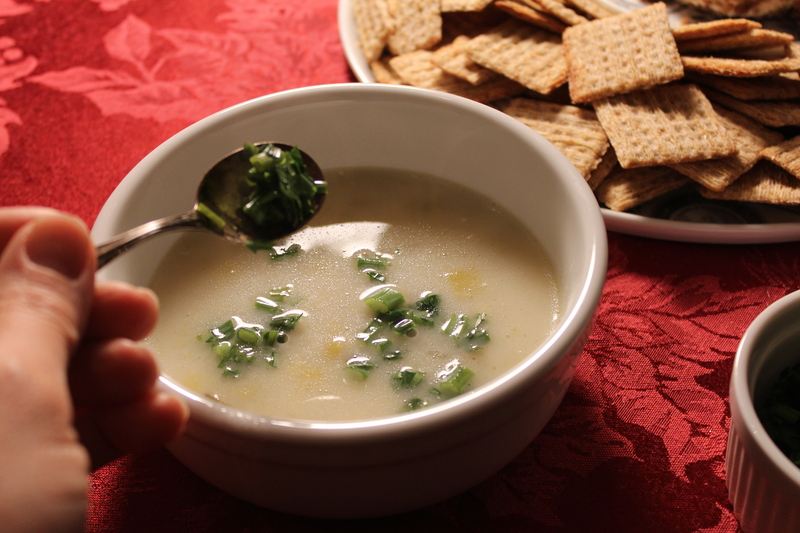 I make the Christmas Eve potato soup as well and every year I make it different. I was one who always loved it and sopped it up with additional carbs…..Mom’s homemade bread and butter. 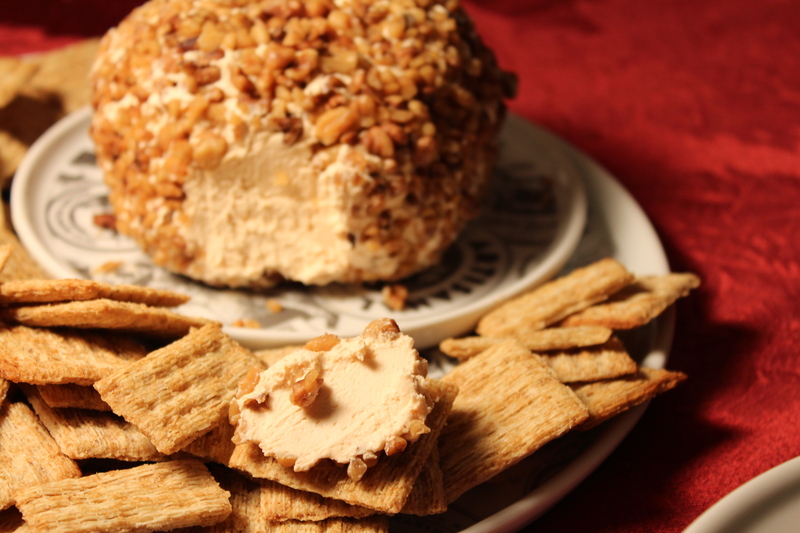 I have a terrific cheese ball recipe you must try which comes from a DE restaurant–its a holiday tradition for Delawareans. It was a flood of memories, us all around Christmas eve table gagging on the soup and fighting for the last Triscuit. I too love potato soup now….crazy. Keep the memories coming. Thanks Beth, I will give it a try this weekend!! I did make Pasta Fazool, mine was a little thick, but over all, was just like I remember. And more importantly everyone loved it!! Awesome, Felissa! Talked to Mom and she said that Nonnie used to add a bit of dried oregano to her pasta fazool. I’ll try it next time but didn’t notice a missing flavor. I’ll report back. Next is biscotti with your Mom next weekend. The gods help me but I am going to try to videotape the demo as well. Fortunately, Stephanie will be back to handle camera duty.